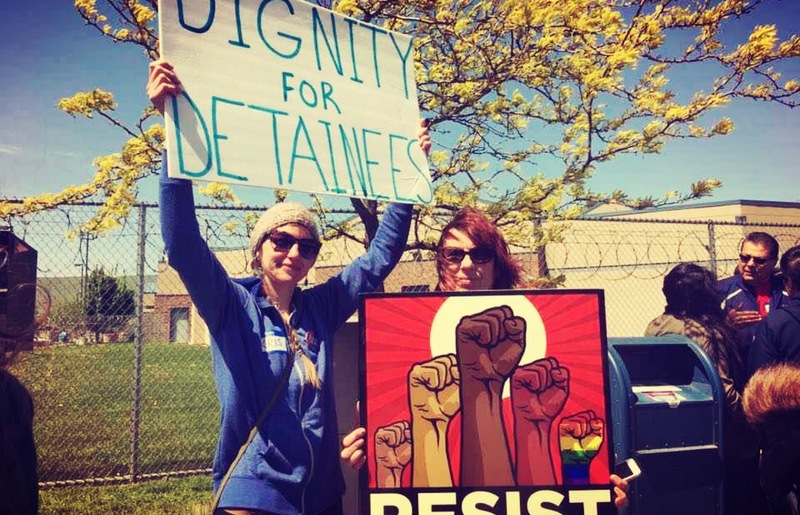 In the last week, we’ve seen a successful hunger strike take place at a detention facility in Northern Oregon, and another pop off at a prison in Indiana. With other uprisings, strikes, protests, and actions happening across other US prisons, we should all find ways to support ongoing organizing and solidarity efforts. In Tacoma, protests continue outside of the Northwest Detention Facility, the site of several previous hunger strikes. In May, we interviewed an organizer supporting hunger strikers on the IGDcast. Northwest Detention Center Resistance has continued to maintain a presence, keep up support, and also held a Day of the Dead celebration outside of the facility. On November 11th they are holding a rally, so please support them, follow their page, and see how you can contribute to their work. In early November, a hunger strike broke out at the Norcor County Jail in Northern Oregon, at the Northern Oregon Regional Correctional Facility. The hunger strike was launched on October 31st, and ended on November 4th and involved 20 people, with people from the community also demonstrating outside in solidarity. In the second hunger strike at NORCOR this year, detainees refused food to bring attention to poor conditions at the jail including inadequate food and poor nutrition, the high cost of commissary items, unaffordable phone and video calling rates, lack of in-person visits with family and friends, lack of access to any outdoor space and exercise, and inadequate library and activities. “All together we won!” is the message we just received from hunger strikers at NORCOR jail in The Dalles. A jail administrator visited hunger strikers today and committed to meet some of their demands in the next 2-3 weeks. Hunger strikers have won better food, more activities including one hour outside in the yard and longer tv hours, and the opportunity to wear their own warmer clothes. A huge victory! Hunger strikers also shared that they could hear our chanting at the rally yesterday! Congrats Gorge ICE Resistance and all the groups in the gorge for your incredible and inspiring work! Several inmates at Wabash Valley Correctional Facility have announced that they have begun a hunger strike to protest their deteriorating conditions. Their immediate demands include: removal from camera monitored cells, relocation from abusive staff, and the cessation of tampering with food and the confiscation, reading and withholding of mail by administration. The announcement follows a sequence of escalating problems that have unfolded in the prison for the past several months, rekindling a too-long dormant culture of resistance to IDOC policies. For some time, the IDOC has pursued a path of repression characterized by the isolation of inmates whom it perceives as threatening to the stability of their regime of oppression. These inmates are often kept in Indiana’s form of solitary confinement known as “Secure Control Units.” Wabash Valley has taken this practice, widely recognized to be a form of torture, to new extremes by indefinitely detaining inmates in isolation cells monitored 24 hours a day through video surveillance. In response, a call-in campaign has been launched. Here is an image to share on social media if you can and organize a call in event to help prisoners. Meanwhile, action has continued on both sides of the bars, with people in Durham taking to the streets against another death in custody, things still going down across South Carolina, and the Free Alabama Movement (FAM) releasing a new statement – so be sure to stay up with Bloc Party in coming days for more information.